These sets do represent pretty good parts packs, with many repeated elements and a nice selection of parts that have been introduced over the last couple of years. 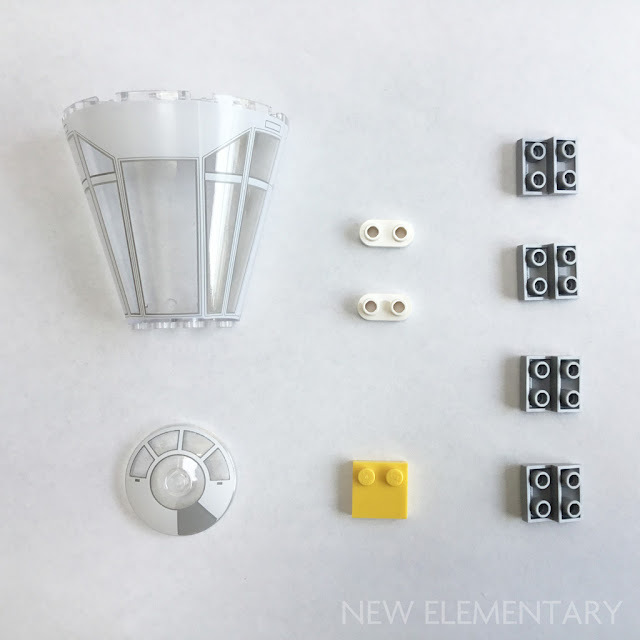 For those of us who are "parts monkeys" though, any new set holds the potential to contain interesting or useful new parts. Sadly, given the volume of LEGO elements here, there are only a handful of new parts. 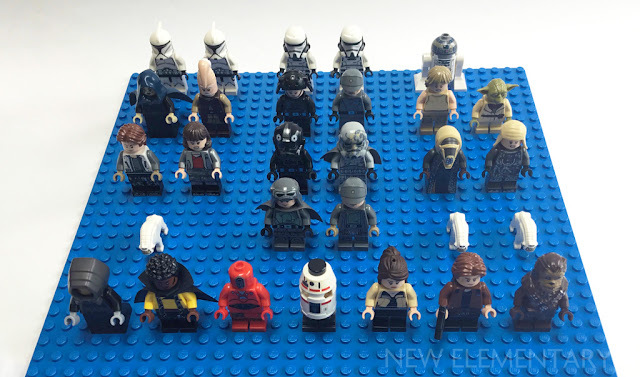 I hoped there would have been a greater number and a good few recolours but these are limited, perhaps owing to all the moulds being given over to new minifigures. So, let's have a look at what you'll really be spending your money on if you buy any of these sets. 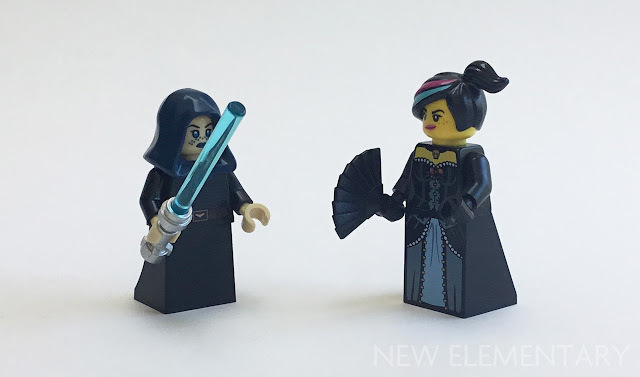 The sole new piece in this set is the new minifigure skirt piece, which is available in three of these new sets, but here presented in Black (Element ID 6219463 | Design ID 36036). If used in multiples I could see how this piece might make a nice awning, window canopy or door roof feature. The key thing here is the height: 1 2/3 bricks high, to match the height of a standard pair of legs, instead of the previously used slope 2x2x2 (Design ID 3678) which as you can see makes the formally dressed lady taller! 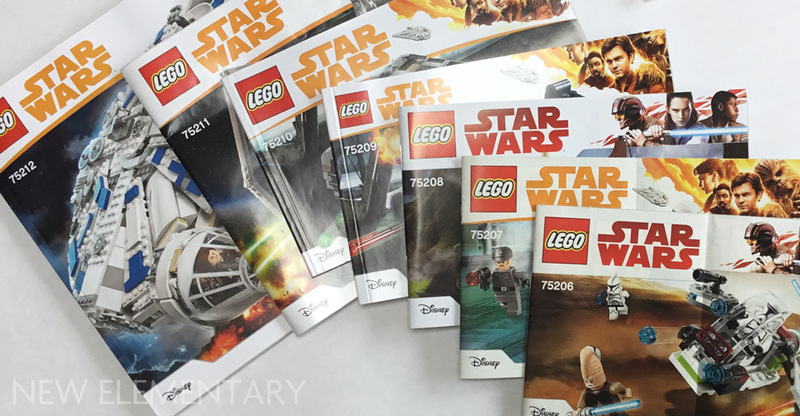 75206 Jedi and Clone Troopers Battle Pack is available now with RRP of £12.99 / $14.99 / 16.99€. Buy from Amazon USA | Amazon UK and New Elementary receives a few pennies! 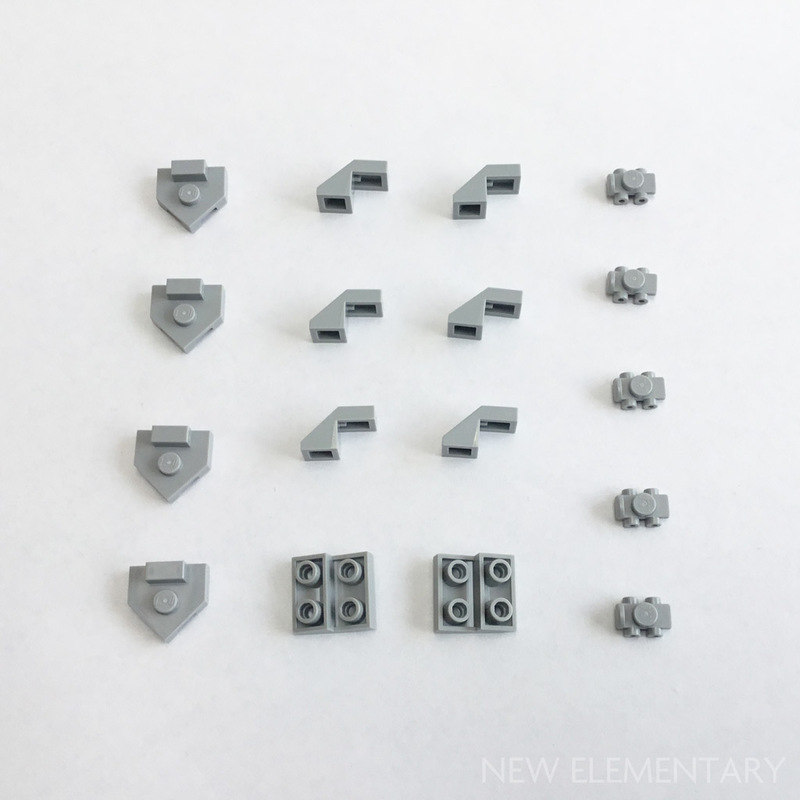 There are no new "building" elements in this set at all. I highlight the following two perhaps only from a nerdy need to have something to show for the full sequence of set numbers. 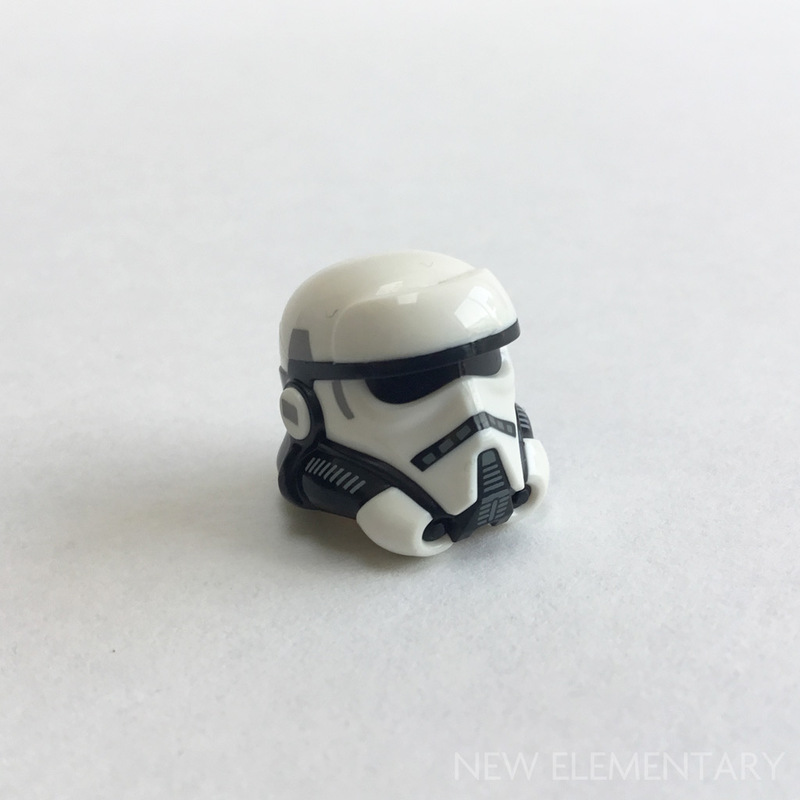 The Imperial trooper's helmet (Element ID 6223644) is a great new minifigure piece... I'm a real fan of dual mouldings, and here they really are getting the maximum out of the process. There's also a round 1x1 tile in White printed with the Imperial logo (Element ID 6223718). There are quite a few new elements in this set and while they're all recolours, they're ones that I am sure will be welcomed by many. 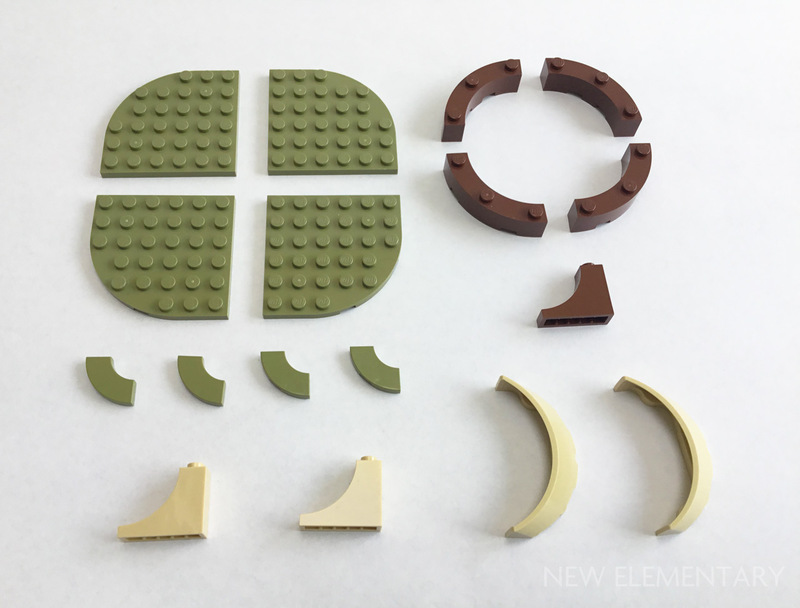 Perfect for ornamental garden MOCs, here in Olive Green is the 6x6 plate with one rounded corner (Element ID 6218088 | Design ID 6003). The 2x2 Macaroni tiles are making appearances in lots of colours now and here they're included in Olive Green (Element ID 6218089 | Design ID 27925). The thing I would really like to see make it into production would be the 3x3 macaroni tile, for obvious usage in conjunction with the 2x2 and 4x4 tiles. I can't believe this piece is appearing in Reddish Brown for the first time but the 4x4 Macaroni brick (Element ID 6211774 | Design ID 48092) is indeed making its debut in Yoda's hut. 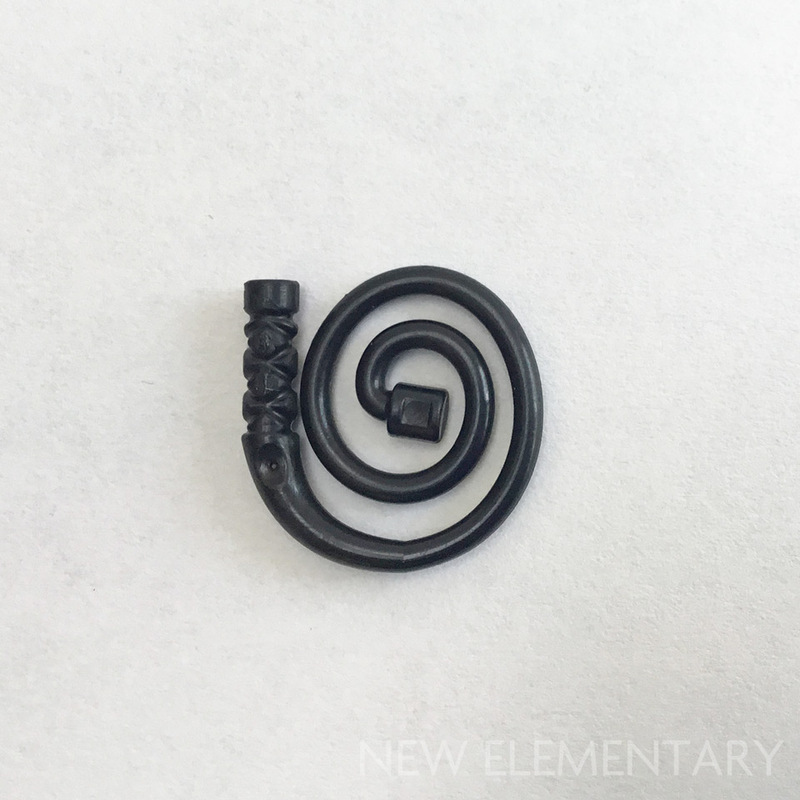 Also in Reddish Brown is the 1x3x2 inverted arch (Element ID 6133833 | Design ID 18653), and while it's not strictly speaking new or exclusive, it was only available in Ninjago 9446 Destiny's Bounty previously. The inverted arch makes a second appearance in this set in Brick Yellow [TLG]/ Tan [BL](Element ID 6212038 | Design ID 18653) and is new but not unique; it will also be available in 31081 Modular Skate House, which is also available now (Amazon USA | Amazon UK). Also new to Brick Yellow is the curved 3x6 windscreen (Element ID 6218090 | Design ID 62360). 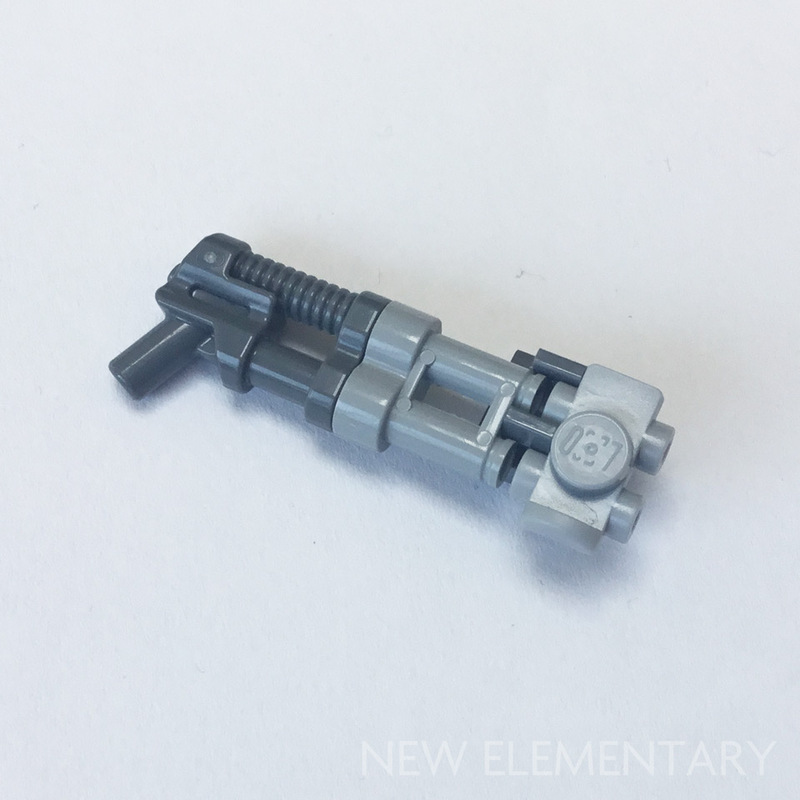 This could be one to watch, as some solid colour versions of this part tend towards the more expensive on BrickLink, and where the Black variant is concerned, downright crazy prices! 1x2x2 2/3 window with rounded top (Element ID 6219783 | Design ID 30044) which appears just once. two of Plate, Modified 1x2 with Pin Hole on Top – which I always think of as 'the P-shaped piece' (Element ID 6223838 | Design ID 11458). Slope 30 1x2x2/3 – the double cheese slope (Element ID 6216905 | Design ID 85984) is present five times. 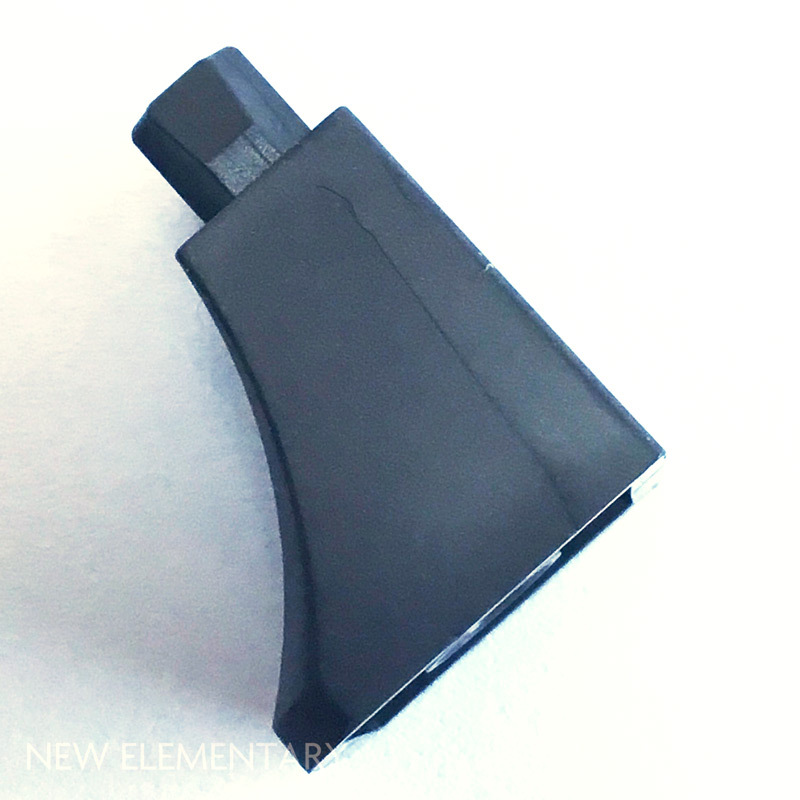 Black 2x2 plate with rounded ends and hollow studs (Element ID 6210270 | Design ID 35480) which, although not exclusive to this set, is new for 2018 and reviewed here on New Elementary. This is a nice new piece and one I'm very happy to have in a multiple of four to experiment with. 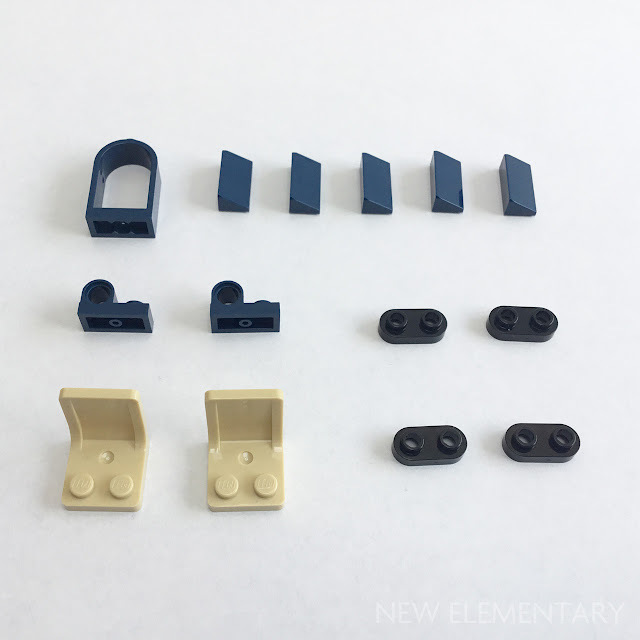 The last is slightly surprising to me as I thought I already had these in Brick Yellow, but apparently not – 2x2 minifigure seats (Element ID 6219785 | Design ID 4079) have not officially appeared in Brick Yellow before, in either of its two variants. 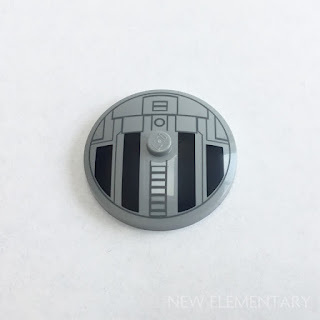 I have both fond and frustrating memories of this part from my childhood, specifically its inclusion in the fantastic 6927 Mobile Tracking Station, one of my favourite sets. The lab is open to the vacuum of space, but in order to sit down, my spaceman must take off his air tanks... arrgh! They can of course be worn on the front, but surely asphyxiation is a risk, right? 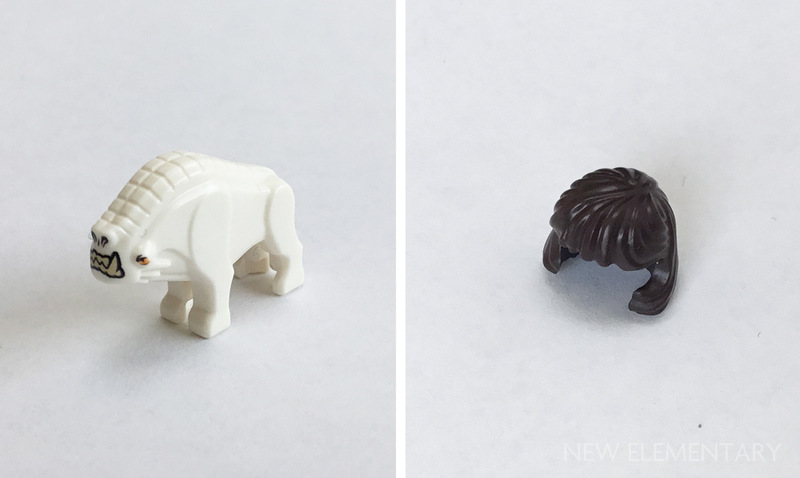 Two final pieces to show are the intriguing White Corellian Hound (Element ID 6223408 | Design ID 36032) which despite its appearance is quite small – only 3.25 x 1 x 2.5 studs – and Qi'Ra's hairpiece in Dark Brown (Element ID 6223875). This is a really nice new hairstyle, one I hope will make more appearances. Superman fans: in this colour it's perfect for a Lois Lane! Slim pickings again. For many I suspect the Corellian hound will be the major attraction here, as you get two of them in this set. 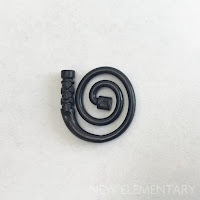 New in Black is the coiled whip (Element ID 6224071 | Design ID 61975), a part which if I recall correctly was introduced for Indiana Jones "way" back in 2008, so no spring chicken to be getting a second colour. 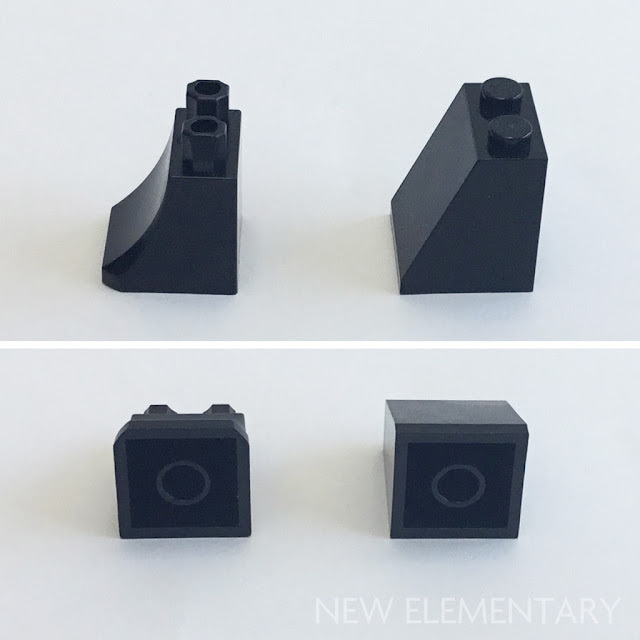 One of the first things I noticed about the new minifigure skirt in Titanium Metallic [TLG]/ Pearl Dark Grey [BL] (Element ID 6223484 | Design ID 36036) straight out of the box was a hairline crack; I think it's a moulding issue as it seems to follow the flow lines in the plastic. 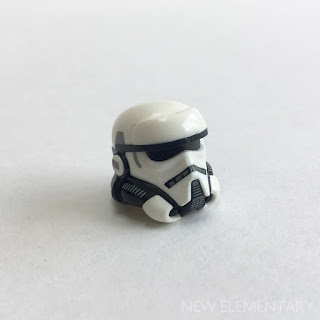 If you find these too, be sure to report them to LEGO Customer Service, kids. The headpiece for Moloch and his sidekick's hat are also new moulds. The headpiece for Moloch just screamed out “micro-build” to me. By emptying all the bags of this bad boy out (an act I've recently heard referred to as "LEGO on hard mode") you are faced with a wild sea of grey and black parts but this set contains the pieces I'm most looking forward to using in my upcoming building challenge by far. The Minecraft railway track piece, Plate 2X2 w/ Design (Element ID 6217790 | Design ID 27928). It’s referred to as some-pentagonal-thing-or-other-esoteric-and-long-winded-name on Bricklink, perhaps this needs a nickname? New Elementary readers have suggested things such as "the birdhouse" in the past... any more suggestions? Irrespective of that though, you get four of them in this set. Slope 45 1 x 2 with Cutout without Stud (Element ID 6213378 | Design ID 28192); there is six of them to be had here. Slope, Curved 2 x 2 Inverted (Element ID 6185676 | Design ID 32803); two of this very useful piece appear here. 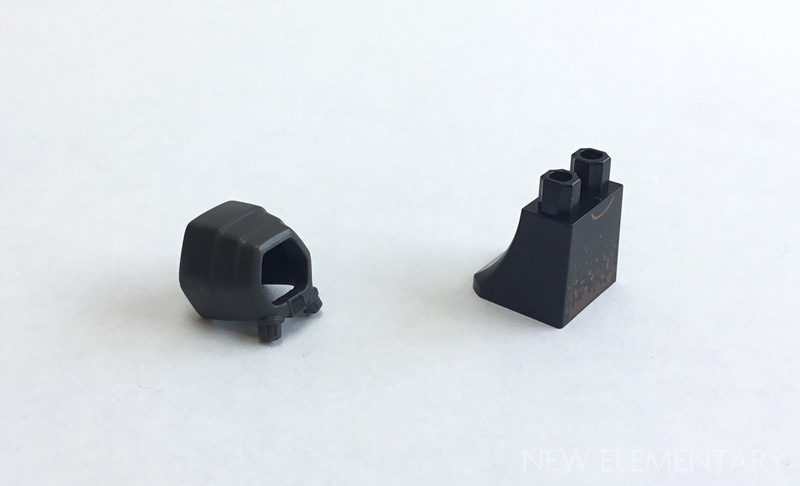 The minifigure rollerskate (Element ID 6217791 | Design ID 11253). This is the greebly part I’m most pleased to see in Medium Stone Grey and again we get four of them. I love these little pieces, they work really nicely with the binoculars (Design ID 30162) which in turn work so nicely with the mini spacegun with rib/double barrel pistol piece (Design ID 95199). 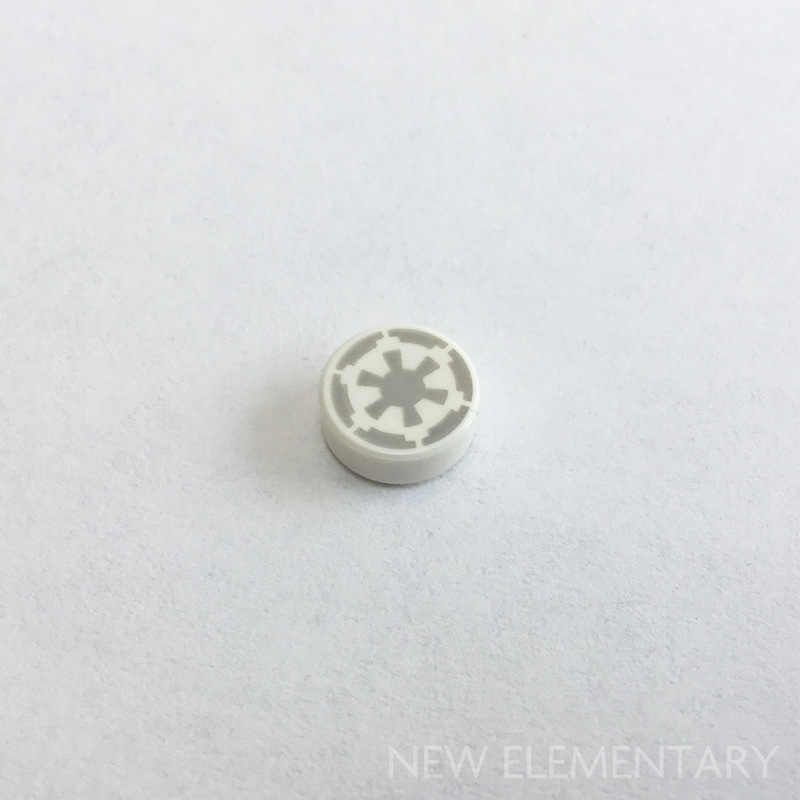 Finally, for those wanting to build various iterations of Tie Fighter we have a new printed radar dish (Element ID 6224386 | Design ID 3960). This is a nice update, as previously the 4x4 cockpit canopy appeared in Dark Stone Grey. As reported in a few other places, the build for this iteration of the Falcon is very similar to the 75105 from The Force Awakens, which in turn owed a lot to the structure and build method from 7965. ...as is the 4x4 radar dish (Element ID 6223409 | Design ID 3960). The new 1x2 plate with hollow studs and rounded ends comes here in White (Design ID 35480 Element ID 6210272). 2x2 modified plate with two studs in Bright Yellow [TLG]/ Yellow [BL] (Element ID 6224666 | Design ID 33909). 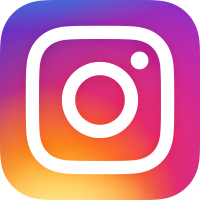 We get just one of these – one! 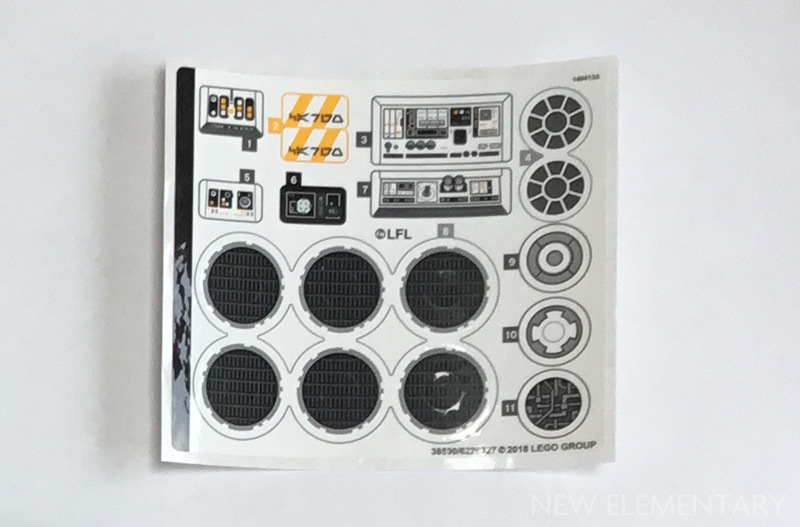 – which the instructions show is intended to have a sticker applied to it. Inverted 2x2 curved slopes in Medium Stone Grey (Element ID 6185676 | Design ID 32803) makes it's second appearance within these sets, and there are four this time. Quay Tolsite has an interesting hexagonal cowl/hood too, in Titanium Metallic (Element ID 6223502 | Design ID 38225). Like Moloch's headpiece, I can see this might work in a micro build ship. She also sports a stylishly printed Black minifigure skirt (Element ID 6225022 | Design ID 36036). "Where'd'ya get that sweet space cape, brother?" 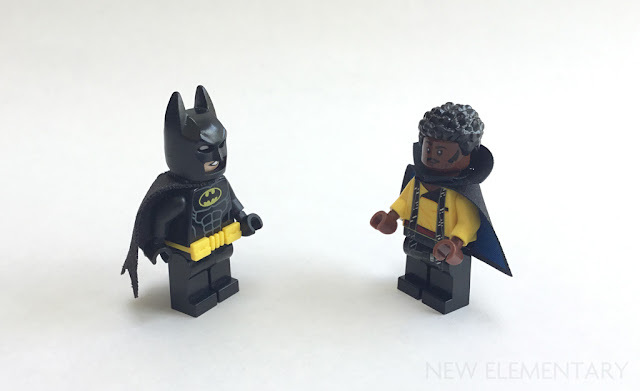 Lando's hair (Element ID 6213798 | Design ID 36060) is really great and is only available in one other set, 76100 Royal Talon Fighter (Amazon USA | Amazon UK) from the Black Panther movie sets. I can't help feeling it's not close enough to the hair style we see Moss sporting in the film. 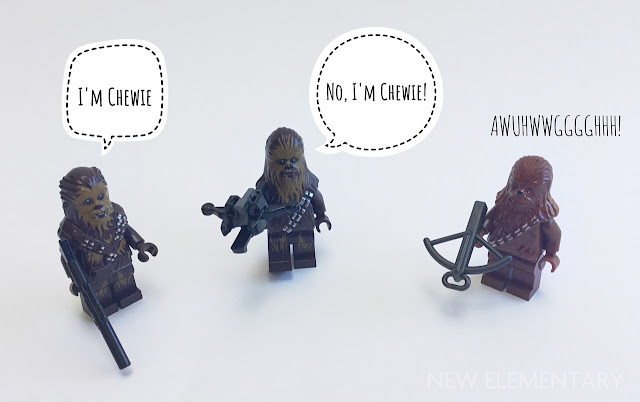 Finally, there is the subject of Chewbacca (Element ID 6223303). I can't decide if this is supposed to be a younger Chewie or just a new mould. This is the third incarnation for Chewbacca, and if this is going to be a replacement, I'm honestly not sure I like it any more than the last sculpt. Even without printed eyes, the original has a charm to it that I like so much more than either of the newer versions. Is that nostalgia? I don't know. 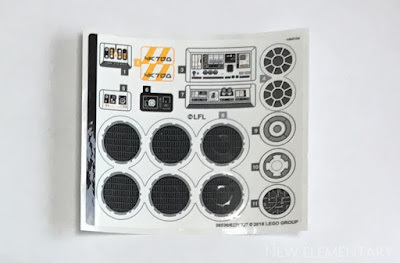 The good news for sticker haters is that there is only one sticker sheet within these seven sets. Admittedly it's for the most expensive set, but if stickers are good enough for 75192 then why should this Millennium Falcon be any different? In closing, all I can say is that there are a lot of parts here! I have partially sorted them and I am in equal parts daunted and excited by the building challenge ahead. Birdhouse plate works for me. But how about "Penta-Jumper?" 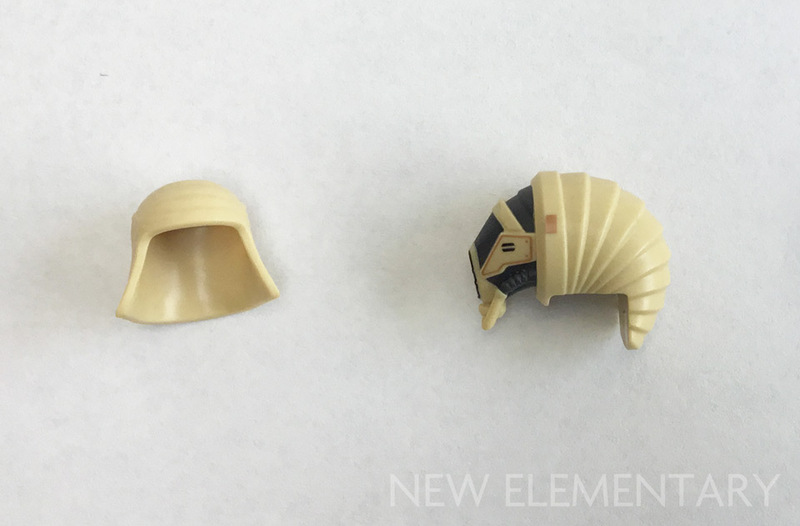 My takeaway from these parts and recolors: seriously, the minifig chair has never come in tan before? So many interiors to everything is tan! How'd this go so long? The black whip is really nice! There can now exist villainous mustachioed men across all of lego, MUAHAHAHAHAHAHA!!! 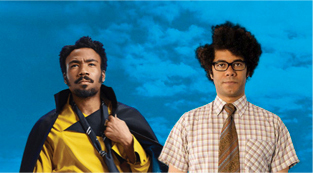 *twirls face whip"
Comparing Lando and Maurice cracked me up! Thank you for the update on the parts! Still putting my vote on calling it the "home plate". Ooh. I like that one! For the tan minifigure seats, I wonder if you might have mixed up with the 30149 part (Vehicle, Base 6 x 5 x 2 with 2 Seats) which indeed came in tan in several sets. The black windscreen is probably expensive on resale sites as it is in the Arvo Brothers set/book of Kaneda's bike from Akira. 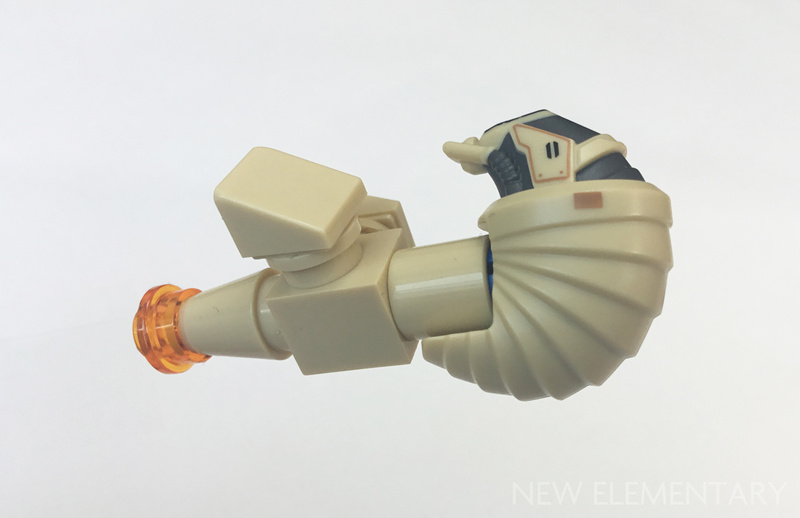 If you are building that bike it is almost worth buying the Ninjago set that the piece appeared in and using all the other parts elsewhere. The bike is a pretty fun build, but some of the parts needed are ludicrously rare and expensive. YES! I finally found somebody else that thinks the classic Chewbacca looked the best. All you need is the bandolier and the nose, that's it! No more printing, no new molds, stop drilling, you struck oil the first time! Now I can understand some of the changes for the Solo version as the bandolier is different, but what the heck is going on with the fur on his head? Ugh, it's awful. Classic Chewbacca all the way. Props to anyone that has any of the original brown ones, too. Classic Chewbacca looks best in classic brown, followed closely by reddish brown. Any other version doesn't work. Although surprisingly, the wookiees that were from Rebels looked great as minifigs, so it's just Chewbacca that LEGO found a way to screw up, which is sad. Oh, and the nickname "home plate" for part 27928 works great for me, too! Nice suggestion, Bfa!